SANTA CLARA, CA. — Former USA women’s soccer gold medalist, Brandi Chastain, has been named the keynote speaker at Santa Clara University’s 163rd undergraduate commencement ceremony scheduled for June 14, 2014. Chastain’s selection to give the commencement address memorializes the 50th anniversary of women’s athletics at Santa Clara which the University celebrates this year. Chastain will address graduating seniors and their friends and families where she will also receive an honorary Doctorate of Public Service. 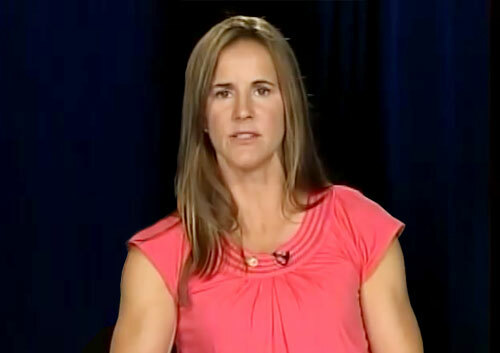 Photo shows women’s USA soccer gold medalist, Brandi Chastain, speaking with FoxSports in 2009 about her about her famous game-winning World Cup goal against China. Watch the following 2009 video as Brandi Chastain speaks with FOXSports.com about her famous game-winning World Cup goal against China, as well as the evolution of the women’s game. Chastain earned a degree in communication from SCU in 1991. She was named an All-American twice in soccer during her time as a student. She was also the assistant coach for the Santa Clara Broncos from 1994 to 2000 and is currently in her fourth season as a volunteer assistant coach. She is a former member of the United States women’s national soccer team and has won two Women’s World Cup championships, two Olympic gold medals, and an Olympic silver medal. If you would like to book athletes like Brandi Chastain for a speaking engagement or upcoming event, contact Brandi Chastain’s booking agent for appearance & speaker fees or call 1.855.303.5450.